Recently interviewed by SciencePoles, Dr Valérie Masson-Delmotte is a paleoclimatologist and leading expert on Antarctic and Greenland ice cores. Based at the French Laboratory of Climate Science and Environment (CEA-CNRS UVSQ). She also contributed to the recent IPCC Fourth Assessment Report, and the author of children's books on the subject of climate and polar exploration. What is the difference between Greenland and Antarctic ice cores? Although the ice sheets of Greenland and Antarctica are both comparable in depth - about 3 kilometers in Greenland and up to 4 in Antarctica - the centre of Antarctica is a desert where it snows about 2cm a year, whereas in Greenland, precipitation is about ten times greater, or on average, 20 centimeters a year. This means that in Greenland, segments of ice core corresponding to one year will be much thicker and with a higher resolution, but that the entire core will not go as far back in time as in Antarctica. It's a question of dynamics with Greenland being much more active due to its warmer climate, higher level of precipitation, and faster process of accumulation and outflow. We estimate that on average, Greenland ice is 40 000 years old, whereas for Antarctica, the figure is 120 000 years. 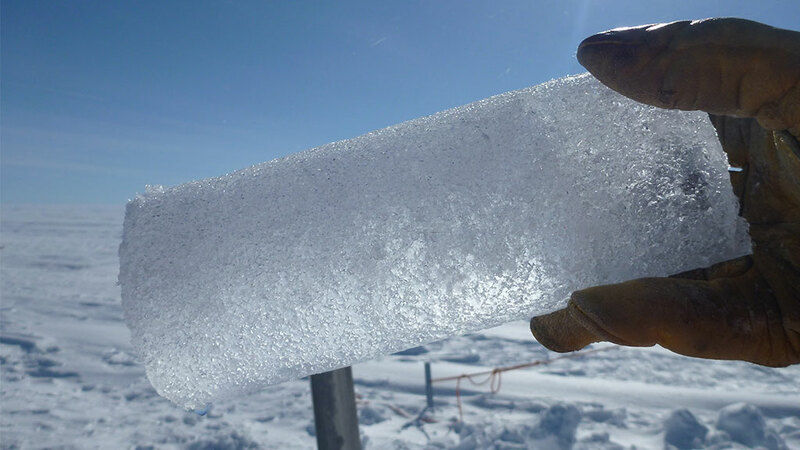 When were the first ice cores extracted? The extraction of ice cores in Antarctica and Greenland goes back to the 1960s. In those days they didn't go very far back in time and the data obtained was still very preliminary. Ice core research really took off in the 80s, and in recent years we have been able to extract an Antarctic ice core that goes back 800 000 years, which equates nine cycles of glacial and interglacial periods. In Greenland, the oldest ice core goes back slightly more than 120 000 years. What have they already taught us about the history of climate? Firstly, that the climate cycle (or global temperature) is always coupled with the carbon cycle, and that the cause or trigger of glaciated periods is found in the variations in terrestrial orbits as the Earth's trajectory around the Sun varies and modifies the Earth's incoming solar energy. This phenomenon is then further amplified by climate feedbacks such as changes in the composition of the atmosphere. Secondly, that we can have very brutal climate fluctuations and responses on the local level. This is particularly the case for the North Atlantic where, during the last glaciation, the climate underwent about 25 abrupt changes (over a few decades or centuries) as a result of a reorganization of marine currents (events that have contrasted effects north and south, as a result of heat redistribution). How has the natural fluctuation of climate changed since the dawn of the industrial revolution? Ice cores show very clearly that a change occurred in the chemistry and composition of the atmosphere right at the outset of the Industrial Revolution. In comparison with the natural level during warm periods, we can read a 30% increase in the concentration of carbon dioxide in the atmosphere over the last two centuries. We can also read a doubling in the atmospheric concentration of methane. So not only are we in the process of changing the composition of the atmosphere, but on top of it, we are doing so extremely rapidly. In regards to changes in climate, readings have to be more subtle. In Greenland, it is only in the past ten to fifteen years that we have detected a warming that is above what is considered natural. But this warming also seems to be occurring more rapidly then in previous warming cycles. In the center of Antarctica, we are not currently seeing any warming. There is even a slight tendency to cooling. However, on the Antarctic Peninsula, the warming is very pronounced and this can be read in ice cores extracted from that region. Generally speaking, though, central Antarctica is an exception in a world that is definitely warming. What can ice cores still teach us? What are the big questions in ice core science today? There are still four major questions which have been underlined by the international ice core research programme, IPICS (International Partnership for Ice Core Science), which currently pools resources from 29 nations. The first question is 'How did the climate and carbon cycle evolve prior to 800 000 years ago?' We know from studying marine sediments that the rhythm of glaciation periods underwent a major reorganization between 1.5 million and 800 000 million years ago, but we do not have any CO2 atmospheric concentration data from that period. Before this reorganization, glaciation periods where more frequent, occurring every 40 000 or so years. During the last million years, glaciation periods have become more intense, and with longer cycles of around 100 000 years. What we want to know is what caused this shift. It's a fundamental question if we want to understand how the carbon cycle reacted at that time, and how it might react in the future. The second key question is to understand the stability of the Greenland and West Antarctic ice sheets during the past warm period. We know that 125 000 to 130 000 years ago the climate was up to 5 degrees centigrade warmer than it is today. We also know that sea level at that time rose as much as three to six meters above, so there must have been a partial meltdown of the Greenland ice sheet, probably mostly the Southern part of Greenland, but also of West Antarctica. But we don't know the speed at which this happened, and this is a crucial question to help develop mid-term models looking at what might occur over the next one to two thousand years as the ice-sheets respond to the current warming. The third question or objective is to retrieve an array of cores from both in the Arctic and Antarctic covering and giving us a more detailed picture of the past 40 000 years and going back to the maximum of the last glaciation, allowing us to follow the sequence of events during the most rapid climate changes. Where does it start? How quickly does it happen? And finally, the fourth question is to learn more about the effect on the climate of natural occurrences such as volcanic eruptions and solar activity on the millennial scale. These are things that remain very difficult to quantify and for which we have to combine an array of small ice cores which go back as little as one to two thousand years. The advantage of this time scale is that it can also be done in glaciers in tropical and temperate regions, thus obtaining a record that stretches far beyond the Poles, so that variability can be tracked geographically across the globe. What are the locations of the next big ice coring projects? The next big ice core project is the NEEM project in Greenland, which has just started and which should begin deep drilling in 2008 hopefully going back some 140 000 years. Fourteen countries are taking part, from Europe, North America and the Far East. In Antarctica, at Talos Dome in the Ross Sea Dependency, there is a Franco-Italian-British project that is already operational and which has for aim to go back some 100 000 years. There remains some 500 metres to drill and this should be done during the next season. And as mentioned before, the Americans are also starting a big project, the West Antarctic Ice Sheet Divide (WAIS Divide), with the aim of retrieving a full climate cycle in West Antarctica. This is very important, because we think that West Antarctica may have been destabilized during the last warm period, about 130 000 years ago, and up to now we have not retrieved a deep core from this region. There is a lot of talk about a deep ice core being extracted from Dome A at the centre of the East Antarctic ice sheet: A core that might go back 1.5 million years. Can you tell us more about it? The Chinese have carried out and are planning more traverses to Dome A with a view to building a station there and of being the main actors of a deep ice core project in this sector. Dome A is complicated drilling site because it is located at more than 4000 metres in altitude, it is very far from the coast and the existing Chinese station, Zhongshan, from where the traverses depart. Hence the logistics are very complicated and expensive. The site also remains poorly surveyed beneath the ice sheet that hides a complicated and broken topography of mountains and valleys. Past experience at Dome Fuji (where the Japanese retrieved a 700 000 year old ice core) shows us that this could be a problem for the conservation of the oldest ice as it might have been distorted close to the grounding with the continental surface. A lot more information is still needed to be able to choose the best site within a 50 to 100 metre radius of Dome A, and there is still a lot of incertitude about where the precise location should be, but with the surveying that is planned, we should know a lot more in the next two years. All this being said, Dome A is very interesting because the combination of less than 2cm snow precipitation per year, the highly distilled nature of the water particles that make up the ice, and the fact that it is the culminating point of the ice sheet, should enable the extraction of a core that goes as far back as 1.3 million years with very well preserved air bubbles and information. For me going back more than one million years is absolutely essential. It will not only give us a much better understanding of ice sheet reaction and carbon dioxide fluctuations in response to changes in climate in that crucial period between 800 000 and 1.5 million years ago (when glaciation periods underwent a major reorganization), it will also provide us with a range of data to compare to existing cores. What is the French involvement in major international ice coring projects? The French are involved in the management committee of the IPICS programme, including the upcoming coring in Greenland. We were of course extremely active in the EPICA programme which retrieved the 800 000 year old ice core at Dome C, and we are currently establishing a Franco-Chinese collaboration agreement for Dome A to drill an initial core to a depth of about on thousand metres. We are of course also very interested in collaborating with China on the deep core at Dome A and to make available our expertise and know-how, but this is still under discussion and should become clearer over the coming months. You've said that you think the history of climate should be taught in schools, to the same extent as human history. Why? We are beginning to live through the first effects of the 'climate experiment' we have instigated by emitting greenhouse gases on a massive scale, and the effects are only going to more and more significant. Speaking conservatively, in one hundred years time, global temperature will have risen by at least three degrees centigrade. And the communities that will be the most affected will be the poorest ones: Communities that are the most dependent on certain levels of precipitation; communities that live close to the coast and have not means of protecting themselves from sea level rise. For people to start to take the measure of the future climatic risk, or to begin to understand the climate of our planet, I think it is important for children to start learning very early what we know about the history of climate, in the same way that we learn about the history of civilization. I don't think this sort of thing can just be learned through the media. People, especially children, really need to be given a grounding in all of this, so that they can understand the basics as much as the broader picture of what makes the climate fluctuate, what dictates the speed of change, what are the key points, the risks of instability, etc... It seems indispensable for me that people have a chance to absorb this dimension of things, because without it, it is difficult to act as citizens. Valérie Masson-Delmotte is a paleoclimatologist and leding expert on ice from the Laboratory of Climate Science and Environment (CEA-CNRS UVSQ). A contributor to the IPCC's assessment reports and quthor of children's books, she also received the Irène Jolliot-Curie female scientist of the year award.